“You say you want a revolution. Well, you know. We all want to change the world. You tell me that it’s evolution. Well, you know. We all want to change the world.” -The BeatlesJim Koch, the man behind Boston Beer Company, not only started a revolution but he has and continues to change the world of beer, his surroundings, the city of Boston and in some cases the planet itself. Jim comes from a brewing family that for generations of Koch’s have wet our whistles with some of the finest brews the world has seen. He is a cornerstone in the craft beer industry and has paved the way for the 1500 craft breweries now in America. He defied style guidelines making what his vision of beer is and where he thinks the future of beer is headed. So you want to talk about evolution? Sam Adams Utopias is the most unique alcoholic beverage on the planet. Officially this nectar is a Barleywine, a categorization having more to due with being made with malt and hops and not its color, palette or aroma. But if it isn’t a traditional Barleywine then what exactly is it? Simply put, Utopia is beer evolved. Having concocted the world’s strongest beer one would think Jim is content and ready to relax. Not quite. Deep within his Jamaica Plain brewery near Boston, Massachusetts, he is planning the next step of the revolution. Why would someone do this? Jim Koch just wants to see if it can be done. When Jim started Boston Beer Company, breweries all over the country were closing their doors. The big three were taking their last swing at the smaller brewers and those that were not assimilated were crushed. Jim went to the Alcoholic Beverage Commission to file the papers to open his brewery and confused the clerk. “You mean you want the paperwork to close a brewery, right?” No, Jim wanted to open a brewery and if that was not bucking all current trends Jim had another bizarre idea. He was going to brew good beer! Prohibition a.k.a. the 21st amendment a.k.a. the dumbest law in the history of the United States of America really screwed this country up. 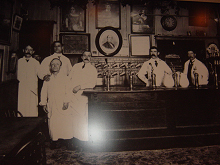 Before boneheads passed this law America was rich with small brewers and recipes from England, Germany and the Czech Republic. After this law passed, Americans had to rely on illegally imported Ales from our benevolent and brighter neighbor Canada. Though Canada has a lot of great beers and a wealth of great breweries, tons of phenomenal American brewing recipes were lost during those dark years. For the next 50 years America drank what Madison Avenue told them was beer. 50 years later enter Jim Koch, a true American Patriot. Armed with his grandfather’s original recipe Jim started the craft beer revolution. The covenant of this revolution is fairly short: give the people fresh beer that consistently tastes great! It is that simple, folks. Jim is extremely committed to freshness and flavor. Every employee of The Boston Beer Company has pull authority if they see old product in the marketplace. Actually they are expected to pull the product if they see it. If any Sam Adams product sits on the shelf beyond it’s freshness date, the store or tavern can return the product with no questions asked. To illustrate how serious he is about this issue, Jim filled a dunk tank with expired Sam Adams and challenged people including the press to dunk him in the expired product. So what does an American Patriot do with his Tuesday afternoon when he is not being dunked in tanks of beer? He gives TheManRoom a rare look at the Chocolate Factory; the world of Jim Koch. Further bucking trends Jim setup up his brewery in a section of Boston nestled between two gang turfs during some of the most violent times Boston has ever seen. As businesses moved out of the Jamaica Plain area of Boston, Jim was moving in and becoming a part of and voice for the community. He knows the neighbors and merchants that surround the brewery by name and makes the meeting rooms available for community meetings. I am a life long Bostonian and even I got lost trying to find the place. With constant contact from multiple people at the brewery and the PR company in New York, an hour late I arrive in the parking lot of Boston Brewing Company. I turned off my car and readied myself for my tardy meeting with this beer icon. At this point I noticed my ashtray was not only on fire but also jammed shut. I ripped my credit card from my wallet and finally pried open the ashtray, dumped the butts and extinguished them with the morning’s eight hour old cold coffee. So far I wasn’t doing too well! Sweating and flustered I bolted into Boston Beer Company to meet Jim Koch. He took one look at me and said “lets get this guy a beer.” OK, I like this guy already! And he was right; I was at the Chocolate Factory! Even being sweaty, late and having my car catch fire it was all worth it. By the end of this column you will see I found the Golden Ticket. The Willie Wonka of beer spent close to 2 hours with me tasting beers, shooting the bull, giving me a great lesson on the history of beer, and great insight on where beer is headed in the future. Here is just a sampling of our conversation. TMR: Tell us about the brewery. JK: The complex is 23 buildings on 5 acres. When we first got here it was mostly abandoned trees growing everywhere and the neighborhood was problematic. TMR: When did you move into here? TMR: Wasn’t that the height of Boston’s Crack wars? JK: That happened more around ’87. We were here for a few years already when it got real bad. TMR: So what did this area look like when you moved in? JK: [pointing to one of the buildings] That was once a chopshop where they chopped up Jaguars. The interesting thing about that building is the 19th century architecture. That was the keg building. Do you see those walls? JK: They didn’t have refrigeration, styrofoam or any insulation. Those are three courses of brick, a foot of cork and two more courses of brick. So when you close those buildings up they range from 55 degrees in the winter to 58 degrees in the summer. TMR: Perfect for aging beer. JK: Exactly; they were like above ground ice caves. TMR: So when was this brewery built? 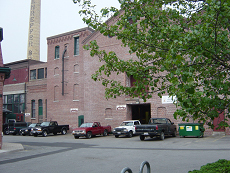 JK: 1870 – one of the interesting things about this building is it was the old Heffenrefer Brewery. 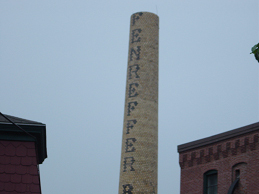 Hurricane Gloria in around ’86 or ’85 took off the top of the smoke stack so it is now the Fenreffer Brewery. TMR: That is too funny because Heffenrefer has blown away so many people so this is only fitting. I have to get a picture. [I take another sip of my Sam Adams] This beer is so good! JK: I know! In 20 years I haven’t been able to make a better beer. And it is a little frustrating for me because this is my great great grandfather’s recipe. I still can’t touch this one. TMR: So this is the recipe that was found in the attic? JK: My father was a brewmaster and he found it. The pages were yellowed with the brewer’s notes scribbled on them. TMR: So how do you duplicate a year’s old recipe when many of the ingredients have changed, especially hops? JK: A lot of the hops have changed with the alpha content going from 4 all the way up to 16. So now the hops are not just for aroma but also for bitterness. The recipe called for Hauletuer hops and they could still be found. The challenge was they were down to 400 acres. But I was happy just being able to find them. TMR: So now you have the recipe and the hops. Why the name Sam Adams? JK: That was easy; Sam Adams was a brewer. He was also one of the first Patriots of the American revelation, a rabble rouser. TMR: I can imagine that Sam got pissed off with all of the British soldiers coming into his pub expecting free pints. JK: That’s right! In the Bill of Rights there is a section about the quartering of troops. [We walk onto the brewery floor] This is where we educate people about the ingredients that go into our beer. Take some of those hops and rip them in half then rub them together and give them a smell. TMR: Oh yes! That smells so good. I love hops. TMR: To some people this place would seem cavernous but I am amazed that you can pump so much beer out of these vessels. JK: We don’t produce most of our beer here. This is where we invent new recipes and experiment; we do produce some of our beer to be sold locally out of here. This is where we do the really fun stuff. TMR: Like Three Weiss Men. JK: That is Dean’s beer and what a wonderful beer. All of our brewers before they become Sam Adams brewers must come up with an original beer. Not an original recipe but something that totally defies the style guidelines. Three Weiss Men was Dean’s baby he started here as a truck driver 20 years ago and now he is one of our brewers. Let me give you a little tasting tour. TMR: That is my favorite part of this job. If you can call it a job! JK: Charlie, welcome to The Chocolate Factory. In this kettle we have some work we are doing on the Utopias yeast. This is just a malt base with the Utopias yeast so that we can isolate the fermentation products. Get your nose in it and you will see how bready and citrusy this yeast is. We are always doing work on the Utopias to see how far we can push it. TMR: What is the furthest you have pushed it so far? JK: A world record 51 proof. Here is another extreme beer. Utopia is pushing the envelope of fermentation. Here is some work we are doing with hops. Take in the aroma of this beer. TMR: Wow this is nice, this beer is me! Jim I am a true hophead. This is very dry in your face but there are huge floral tones. Are these Saaz? JK: Very close but not quite it. How many IBUs do you think are in this beer? TMR: It is not blowing my head of but it is extremely hoppy so I would say around 50 or 60? JK: Double that number! If you have really good hops you can take them up to extreme levels without having a harsh tasting beer. We didn’t want something that tasted like you were licking a pinecone. TMR: Will the market ever see this beer? JK: I don’t know! This is a truly beautiful beer that actually adds something to the world of beer. There is a very good chance that this beer will see the market. TMR: So do we have an exclusive here at TMR? JK: You just might! Here is another one we are working on, a more classic Pilsner. We should probably cleanse our pallets after drinking that hop bomb but let’s just go for it. TMR: This beer is very soft and citrus, I can’t tell if the hops are residual or from this beer. JK: I knew we should have cleansed our palletes! TMR: Jim don’t worry about it. You are drinking with a guy that used to drink Heffenrefer in the woods. I can tough this out. 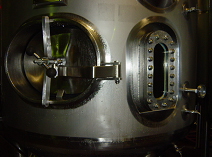 JK: This next tank is our Jules Verne tank. One of our old brewmasters went out to California and made this for us. We had him make us a tank with windows so we can watch what goes on during dry hopping. Now we can watch what goes on during the hopping process. Now we know exactly when to introduce the hops to the beer and which methods work best. TMR: What is in this tank? JK: This is a brown ale that we are working on. Of course it is not as hoppy as the last beers we tried. TMR: I love malty beers in the Fall. Summertime is my hoppy beer period but as the air starts to cool I love a nice malt forward beer. JK: This beer is a great beer for the fall in New England, perfect for that time of year. Here is another beer Dean is working on, more of a Belgium type of thing. This is a big spicy beer. TMR: This has got a cool Saison thing going on. I love this. I have never meet Dean but I am really starting to like this guy. JK: Dean is a great guy, he makes wonderful beers. Let me show you our tasting room. TMR: This is a classic Boston bar in the middle of a brewery. It looks like someone hit Doyle’s with a shrink ray. JK: People ask me all of the time if the is a real Cheers bar in Boston. I think Doyles is the classic bar in Boston. The bar is an institution. TMR: I had a bar like Doyle’s in my old neighborhood called the Model Café. JK: What a great place. I always said when we get beer into the Model I know we have made it. TMR: Well you have made it because they definitely have Sam Adams now. That is a classic bar. You have the Boston College jocks and the punk rockers from Harvard Ave sitting side by side all enjoying a pint of beer with great music on the jukebox. JK: That is exactly what I am talking about. There aren’t too many cities where they really get it. Chicago is a great bar city. New York people get it. But a lot of places in the country don’t have that type of bar scene. TMR: Speaking of bars, I love that bar picture on the wall. It is so cool. JK: That is Jabob Worth’s around the mid 1890’s, aren’t they cool? I love how you can see the pride on their faces. TMR: I love the cash register. You can see the last purchase was five cents. JK: Can you believe that? A nickel a beer. TMR: The funny thing is someone probably bitched about it. Speaking of price there is something I always wanted to know. You seem to keep the price of your beer pretty flat. But you are in a commodity driven business with grain futures and gas futures dictating the price you pay for raw materials and transportation. Is it hard to keep your prices down with volatile market conditions like we are seeing now? JK: We don’t do that with grain but we do for hops for a different reason. We buy them 5 years out. If we don’t commit to the hops the growers can’t produce them. Right now we are committed to 10 million dollars worth of hops. TMR: That is quite a bit of money. So what is next on this tour? JK: This is very cool, it is going to be a moment of reverence. We have 3 truly wonderful beverages. There is nothing bad here. One of them is arguably the best port ever made. 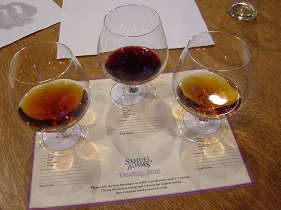 Taylor’s Vintage Port 1994 and one of the finest cognacs on the planet. This is really a treat. I want you to sample and rate each of them and look for the layers of flavors and nuances and tell me which you like best. I love doing this, it is so cool. TMR: This is not fair to you. I am a huge Utopia fan and have sat back and taken in the aroma for 10 minutes without touching it. I am pretty sure I can pick out Utopias fairly easily. Is this any different from what I have had in the past? JK: This is the 2005. It is a little more alcoholic and we really worked on the aromatics. TMR: Utopias is called a Barleywine for lack of a better description but it definitely is not. Has Utopias won any awards? JK: In the U.S. no because it doesn’t fit into any category. For me that is the fun part: creating a category of beverages that never existed before. You have to remember someone had to invent champagne and someone had to invent cognac. Why should that type of innovation have to stop? TMR: So when this bottle of Utopias is cracked how long can we keep it? JK: We don’t know. What we do know is the ‘03 is still good. No one has ever done this before. I can guarantee at least two years at this point. TMR: Jim, I honestly hope you never stop innovating. It is time for me make my beer picks. I have tried so many great beers today but I want to stick to the commercially available brews for my readers. These beer picks are for those of you ready to start a revelation. What a fantastic beer. Beautiful deep brownish-red color that is borderline black. Great malty tones, coffee notes and hoppy-ness combine for the picture perfect bitterness. Samuel Adams® Cream Stout is a true cream stout, balancing body and sweetness with the natural spiciness of grain and hand selected English hops. Our Brewers use generous portions of roasted chocolate and caramel malts as well as unroasted barley to impart a fullness of body, a roasty malt character and rich, creamy head. Its dark mahogany color make it almost as easy on the eyes as it is on the palate. The color is light brown with a slight reddish tint and a fluffy white head. The aroma is all albout malt with nice toffee and caramel tones. The mouthfeel is light and crisp with a hop finish that instantly attacks. Samuel Adams® Boston Ale was first brewed to celebrate the opening of our Boston Brewery. Like Samuel Adams Boston Lager®, it was an old family recipe that was rescued by Jim Koch from his father’s attic. Samuel Adams® Boston Ale, a Stock Ale, has a complex, caramel malt character balanced with distinct spicy and herbal hop notes. Our proprietary ale yeast imparts a variety of fruit and ester notes in both the nose and flavor which are indicative of the style. This beer has a great copper/amber color with a tiny head. The nose is malty with tones of caramel. Ultra smooth on the palette, it offers an initial malty flavor that blends perfectly into a hoppy finish. Let the glass warm a bit in your hand and more and more toffee and spicy tones start to emerge from the aroma and coat your palette. Deep, clear rust-colored, with a great head of foam. Good aroma of amber malt, hops & alcohol. It has a lot of characteristics of some of the barleywines I have had. This beer makes it into the top ten for it’s style if not the top 5. One can not help but appreciate Samuel Adams® Double Bock’s huge malt character. We use an enormous amount of malt, half a pound per bottle, to brew this intensely rich lager. Its deep brown-ruby color is all made in the kettle – no black malt is used, resulting in a rich sweetness that is free of the rough taste of burnt malt. All that remains is the velvet smooth flavor and mouthfeel of the two row malt. Samuel Adams® Double Bock’s intense malt character is balanced with a subtle piney, citrus hop note from the German Noble hops.Due to legal restrictions, Samuel Adams® Double Bock can not be sold in the states of Alabama, Arizona, Georgia, Iowa, Louisiana, Missouri, North Carolina, Ohio, South Carolina, Tennessee, and West Virginia. Next articleSuds With Securb: Hey Tagliabue, I give up!